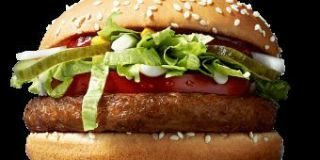 Food & Wine, TODAY, Delish, Grub Street, Elite Daily and Refinery29 report that McDonald’s Finland is testing a new burger called the McVegan. The burger, a soy-based patty, is only available at one location in Tampere, Finland, from October 4 through November 21. The story is also prominent on social media. DIDNT WE LEARN OUR LESSON FROM THE DISASTER THAT WAS McLEAN DELUXE??? No, history means nothing. The people running McDonald's today are much smarter and have many more college degrees than the people who built McDonald's. If something didn't work for the old time burger flippers that just means the Pajama Boy geniuses now in charge can make it work.